Having been involved in a lifetime of sheep breeding with many breeds in many countries I have, after 50 years of close involvement with the Dohne breed, become convinced that it is the most productive sheep breed in the world. Empirical and anecdotal evidence over my entire career has proved this in South Africa. It was well known in the latter part of the last century that Merino breeders could double their income in three sheep generations with Dohne rams. Evidence in other countries has emerged in recent years to support this claim. 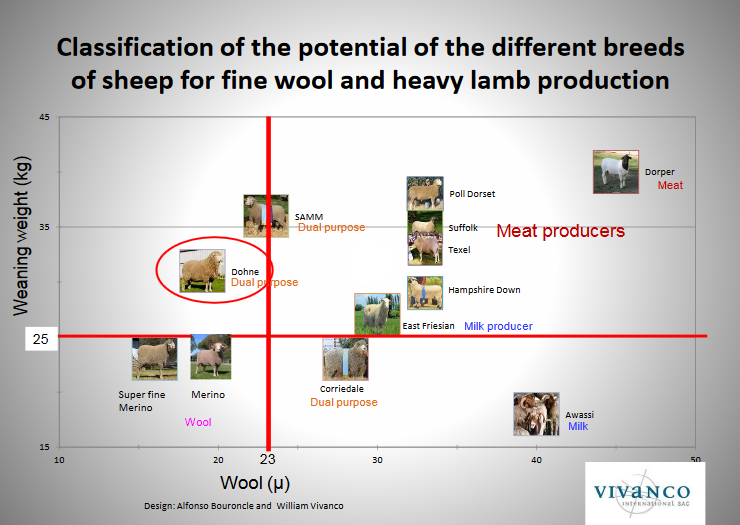 For instance, in motivating an application for funding of the Dohne project in Peru, Dr William Vivanco compiled a diagram illustrating the potential of different breeds of sheep for fine wool and heavy lamb production. Dohnes are clearly in the leading position. (see Birth of a Breed page xi). 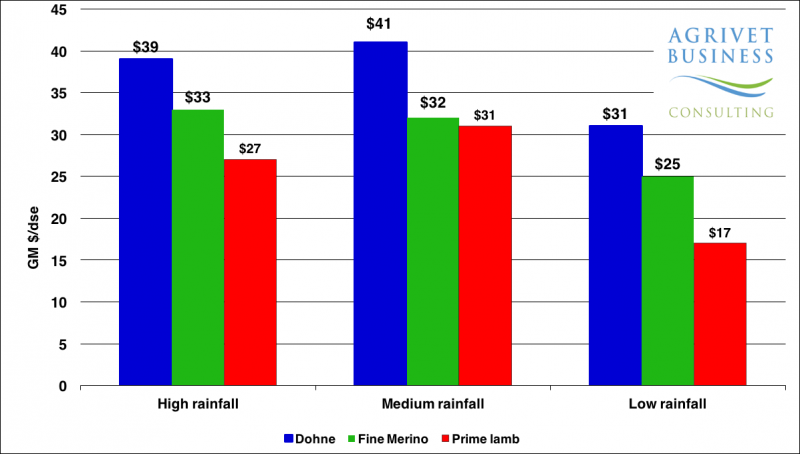 An article in the 2017 Australian Dohne Journal by Dr Graham Lean of Agrivet Business Consultancy reported an analysis which modelled the Dohne, fine wool Merinos and a crossbred Prime Lamb enterprise run in three different environments, and found the Dohne to be more profitable based on the last 10 year prices, whether it is run in high, medium or low rainfall environments (Lean, 2017). This is but one of numerous testimonies by many breeders in Australia and elsewhere that have confirmed this. How did the Dohne Breed reach this elevated position? The answer is very simple. It was born of necessity in a really harsh environment of low nutrition and heavy external and internal parasite load. After relentless selection based on measurement of the best performers over many years in this harsh environment, a hardy and resilient breed emerged. When transferred to better environments, it excelled beyond all expectation. We have designed and bred a unique animal unequalled in its ability to make money in all environments. Are our current breeders up to maintaining the high standards of the pioneers and capable of raising the Dohne to even higher levels of productivity? This will depend on the degree to which we follow the example of the pioneers and adhere to their ethics of breeding. A fundamental attribute of the pioneers was the fact that they placed the interests of the Breed far above their individual interests, working together and co-operating as a close-knit team to develop a sheep breed that would ultimately benefit them all. To this end, at a very early stage, the South African Dohne Society developed a Philosophy which served as a guideline and a blueprint for all to follow. The principles set out in this document are as valid today as when they were first formulated and can serve as a measure of how well we conform today to the standards that were set at that time. 1. We select for maximum productivity in terms of reproduction, maternal ability, wool and lamb growth rate – using objectively measured performance in a low cost commercial environment. When our sheep moved to better environments I became concerned that we might lose the all important trait of hardiness. At a symposium held to celebrate the 21st anniversary of the Society in 1987, a panel of breeders was asked to identify “Priorities for the Future”. Adaptability and hardiness were singled out as the most important characteristics responsible for the success of the Dohne. This was confirmed in 1994 by a panel of breeders appointed to revise the selection index (see Birth of a breed, page 185). The message was clear – select in a natural commercial environment to preserve and develop these traits. When we select on performance in harsh commercial environments, we are also selecting for the important trait of resistance to stress. The result has been more efficient utilisation of low quality feed, non-selective grazing, internal and external parasite resistance, the possibility of higher stocking rates, maintenance of condition and sustained high rates of reproduction and growth even in drought situations – attributes of the Dohne we all know and applaud. The success of selection for parasite tolerance and resistance in the pioneer Wauldby Stud by using FEC and FAMACHA measurements in the most stressful environment known, is a prime example of successful and simple-to-apply selection for hardiness. (Burgess, 2016). The substantial improvement in productivity and incomes after Dohnes were mated to local sheep breeds in severe environments like the Falkland Island and Patagonia confirms the potential of the Dohne in these situations. Wool Production Potential (WPP%) is an important measurement of hardiness and has a direct influence on gross margins. The optimum relationship between body and clean fleece weight at test age is crucial for the maintenance of fitness traits so vital for reproduction and growth. Twenty years ago we realised our sheep were carrying too much wool in relation to bodyweight. We amended our selection index which resulted in a reduction of WPP% and a dramatic improvement in reproduction. (see Birth of a Breed, page 229) The optimum WPP% is 5-6% and it has been consistent at this level in South African Dohne studs for the past 10 years (Delport, 2016). 2. Selection is based on economically important traits, the most important criterion being the measured relative efficiency of our sheep as producers of marketable produce. This implies an undertaking and a serious commitment by Dohne breeders to embark on a comprehensive programme of pedigree and performance recording – a hallmark of Dohne breeding since 1970. This second clause in the Dohne Philosophy has been observed throughout the breeding programme in South Africa. 3. We preserve and improve hardiness and adaptability by exposing the sheep under selection to a natural environment and by avoiding artificial feeding and housing of our breeding stock. This practice precludes participation in competitive show classes in the traditional sense. This is a natural development of the theme in clause 1. How well do we adhere to this rule? In simple terms rams should be reared to test age in large mobs under the commercial paddock conditions where their progeny will ultimately be run. This ensures equitable comparisons between individuals and accurate identification of those best adapted to the commercial environment. This does not preclude the common practise of preparation for sale of selected animals which have already proved their worth. However there are many studs that take pride in offering rams for sale in natural veld (paddock) condition, the highly successful Crux Dohne Stud in South Africa being a good example. There are many other studs that follow this practice. According to the traditions and philosophy of the Dohne breed, competitive showing is not approved of or acceptable. This policy is also endorsed and adhered to by the most successful beef cattle breed in South Africa – the Bonsmara, developed by Professor Jan Bonsma. It grieves me to see that a sheep that was bred over a period of 75 years to be hardy and productive in harsh commercial conditions, is now treated elsewhere as a pampered pet with ribbons and halters. The opinion of a judge, who has no conception of the main traits that have made the Dohne the most productive woolled sheep we know, is not an endorsement. The attributes of hardiness can never be assessed in a show ring. The temptation to breed and select for the show ring rather than for the needs of commercial clients compromises the very reason for the existence of the breed. The most valuable lesson we learned in the early days was to enlist Nature as a partner (not a show judge) and observe the shape and type of animal that would evolve through selection on performance. 4. We select within large flocks using the principles of population genetics and open nucleus breeding systems with a view to achieving the highest possible selection intensity. The Foundation flock register, based on the open-nucleus system, was introduced in 1977. After complying with certain rules, a small proportion of top commercial ewes are elevated on performance to ram breeding flocks. This system has made a major contribution to the performance of the national stud flock. These ewes are valuable because they represent the very best on performance in large commercial flocks selected in a natural commercial environment, thus enhancing the hardiness and adaptability of our studs. 5. We progeny test every sire mated in stud flocks. Comprehensive individual performance and progeny records are kept in respect of every ewe and ram recorded by the Society. Animals achieving exceptional performance are used effectively and extensively in AI programmes where their superior breeding value is exploited. Regrettably there are instances of non-compliance in respect of some of the above principles. In practice the bylaws of the Dohne breeder organizations are based on the Dohne philosophy and provide a way for breeders to meet the high ethical standards for breeding and recording. The robustness of the Dohne breeding system means that if individual traits are not reported, or if they are not up to the required level of accuracy, sheep are not registered – which provides a degree of assurance for clients that standards are being adhered to. Ill-considered genetic infusion of other woolled sheep breeds to pursue short term objectives, will compromise the very existence of the breed and will not be acceptable. Another matter of concern is the fact that some breeders are tardy in submitting data promptly as required by their terms of membership. Since all studs are linked through the genetics that are shared, this will negatively affect the data of those breeders who fully comply. The bottom line is that promptness when submitting data is essential to maintain credibility of the data upon which both breeders and their clients rely. These are very serious breaches of the ethics of Dohne breeding, particularly as Dohnes are held to be the benchmark of breeding excellence and integrity and are consistently advertised as such. 6. We apply a strict system of quality control and inspection in all ram breeding flocks, thus ensuring that only sheep which meet the required standard are used as flock replacements or offered for sale to the industry. This is a fundamental requirement wherever Dohnes are bred and much effort has been put into the training of Dohne assessors over the years. Training is still being done by persons like Dr Delport and Allan Casey. This is the reason why commercial clients have come to trust the Dohne system. To preserve the integrity of the system, it is incumbent on all assessors to maintain the highest ethical standards . They must decline to assess or approve sheep they suspect are not pure Dohnes, have questionable records or lack the mandatory performance and pedigree requirements (Requirements set out in the bye-laws of the various Dohne breeder’s associations). Such sheep should also not be allowed to be sold as approved Dohne sheep on any official or on-property sale held under the auspices of the various Societies. 7. We provide buyers of Dohne Merinos with comprehensive information related to the relative productivity of every animal offered for sale – information which enables them to rapidly achieve the objectives they have set. Every Dohne ram breeder, when joining a breeder’s association, made a signed commitment to abide by the breeding principles and rules of the Association. I am proud to say that in South Africa we have adhered to this philosophy and the acceptance and application of the principles set out in this document are not questioned. At current high wool prices we are also faced with some commercial clients switching to Merino rams. This is a temporary phenomenon not justified by the ratio of total flock income from meat compared to wool. This misconception will have a larger negative impact than even that proven by Dr Graham Lean for Australia (Lean, 2017). Wool prices might drop. Lamb prices will rise. Commercial breeders making wrong decisions will seriously lose out. Even at current high wool prices, breeders achieving a reproduction rate of 130% and more, will earn 80% of total flock income from meat and only 20% from wool. I agree with John Nadin’s remark to me – “The commercial breeder hasn’t been educated in the use and value of ASBV’s and our breeding system and philosophy” (personal communication). We have the responsibility to continue with an intensive campaign to educate and inform our clients about the Dohne Advantage. I am grateful to Dr Kobus Delport and Allan Casey for commentary and suggestions that have been incorporated in this paper. I am very grateful and would like to thank Carolina Viñoles for translating this paper into the Spanish language. Burgess, M. 2016 “Wauldby Dohnes: on the veld for 68 Years!”, Farmers Weekly 15 Jan 20126, page 53. Delport, GJ. 2017. Council Report, South African Dohne Journal 2017, page20. Ferreira, A. 2017 “How does the Dohne Merino clip compare to the South African clip”? South African Dohne Journal 2017, page37. 3. We preserve and improve hardiness and adaptability by exposing the sheep under selection to a natural environment and by avoiding artificial feeding and housing of our breeding stock. This practice precludes participation in competitive show classes in the traditional sense. This is also the reason why a maximum wool length of six months is set for Dohne rams entered on official sales, thus keeping to a minimum the time necessary for sale preparation.